The largest collection of ‘best in class’ coloured gemstones from around the world are to be showcased at Bonhams Hong Kong as part of its forthcoming Rare Jewels and Jadeite auction. The carefully curated selection of gemstones – titled ‘The Jewels of the World collection’ – has been chosen based on their exceptional quality, rarity and beauty. The selection includes Colombian emeralds, Burmese rubies and sapphires from Kashmir and Ceylon as these continue to be in the spotlight. It will also include gemstones from a number of other important regions that produce gems which are equally as beautiful and as rare. These regions include Kenya, Tanzania, Madagascar, Tajikistan, Afghanistan, Mozambique, Brazil and Australia. Graeme Thompson, Head of Jewellery for Bonhams Asia, said: “As part of our first sale of 2017, we are delighted to present some of the rarest and most beautiful gemstones the world has to offer. “The increasing popularity of natural coloured gemstones has been driven by growing demand from around the world and interest in them is now widening to newer areas. Many of the world’s coloured gemstones have similar optical properties, such as Madagascar and Kashmir sapphires or rubies from Burma versus those from East Africa. Irrespective of their origin, the best examples of coloured gemstones tend to have a limited production of fine material because the mines are finite and production will come to an end at some point, therefore these natural wonders are extremely rare and highly sought after. have emerged include Madagascar, a treasure island of its own producing sapphires, rubies, and fancy sapphires in a wide range of attractive colours amongst other gems. Mozambique is a recent source of rubies of excellent quality and copper-bearing tourmalines of vivid colours, Tanzania for attractive pinkish red spinels and blue-violet tanzanite of exceptional clarity, Kenya with green tsavorite garnet and Zambia in East Africa for beautifully saturated green emeralds, just to name a few. The sale, which will feature a total of 103 of lots, and take place at 3pm on 31st May 2017 at Bonhams Hong Kong Gallery, One Pacific Place. 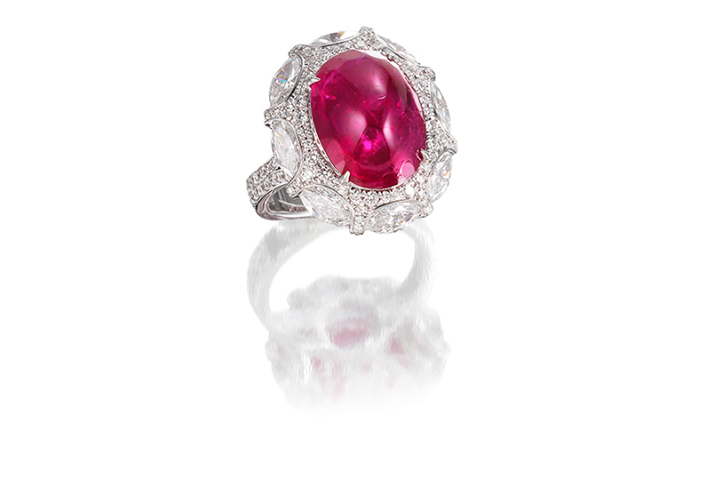 One of the most important pieces in the Jewels of the World collection is An Impressive Burmese Ruby Ring. Burma is famous for producing the finest rubies and stones over five carats are extremely rare and highly sought after. The ring’s central antique cushion-shaped ruby weighs 6.44 carats and it is surrounded by smaller oval and circular-cut rubies. It has a pre-sale estimate of HK$2,750,000-3,000,000 (US$350,000-390,000) and is accompanied be a SSEF report stating that natural ruby has no indications of heat treatment and originates from Burma (Myanmar). 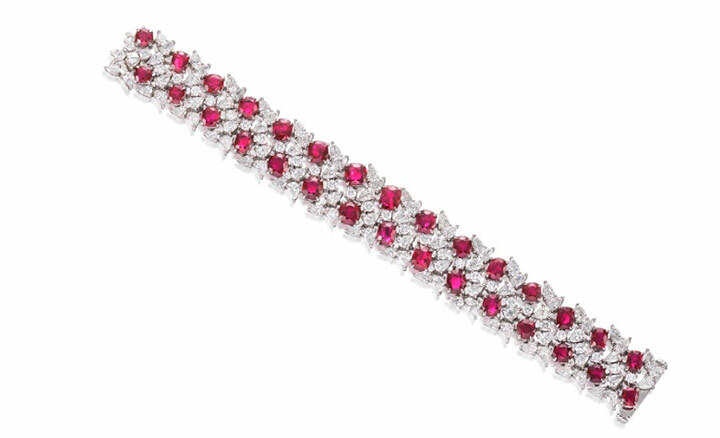 Bonhams is also delighted to be offering An Important Ruby and Diamond Bracelet in its sale. The articulated bracelet set with two rows of cushion-shaped rubies, between pear and brilliant-cut diamonds. The bracelet totals 30 carats of rubies which are vivid red colour (SSEF ‘pigeon blood’). They are complemented by approximately 18 carats of diamonds. It has a pre-sale estimate of HK$2,300,000-2,800,000 (US$300,000-360,000) and is accompanied by a SSEF report stating that the 30 natural rubies have no indications of heat treatment and originate from Burma (Myanmar). Due to their chemical composition resulting from marble bearing deposits, Kenyan rubies are known to exhibit similar optical properties to their Burmese counterparts. This Ruby, Tsavorite Garnet and Diamond Ring features a magnificent and rare 10.06 carat step-cut ruby, originating from Kenya. 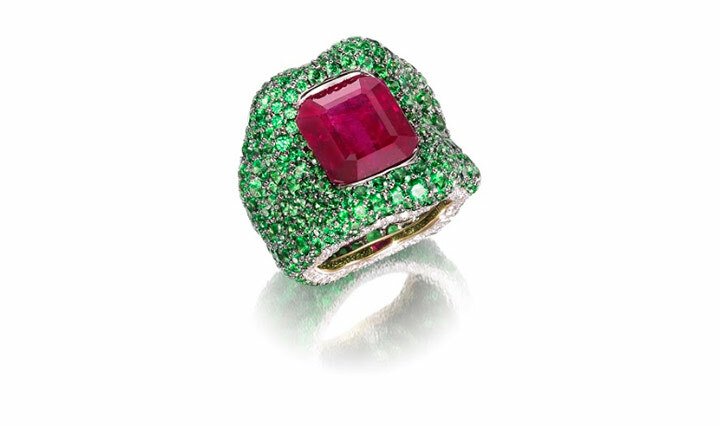 It is set within a pavé-set circular-cut tsavorite garnets surround, accented by similarly cut diamonds. It is estimated at HK$1,500,000-2,000,000 (US$190,000-260,000) and is accompanied by a Gubelin report stating that the ruby has no indications of heat treatment and originates from East Africa. The mines in Mozambique are producing extremely high quality examples of the finest rubies since the discovery of the Montepuez deposit in 2009. What makes the Mozambique rubies special in the fine gemstone market is that the mines are producing some larger gems that do not require heat treatment. By comparison, recent production of Burmese rubies has been almost exclusively in smaller sizes, with the vast majority of gems requiring heat treatment. 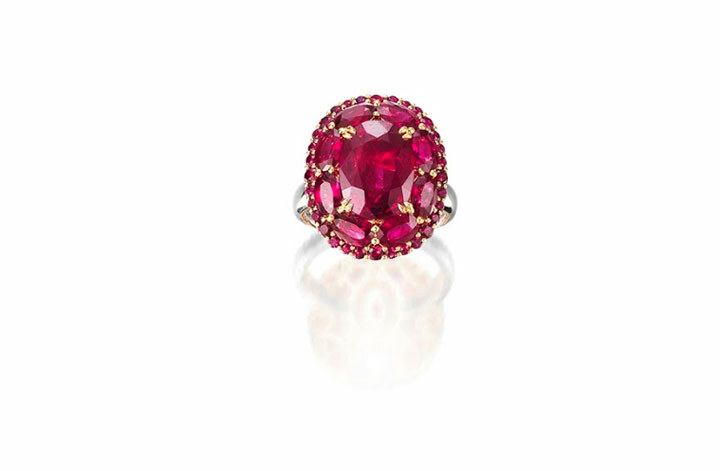 This Ruby and Diamond Ring is one of the finest examples of a natural ruby from Mozambique. The oval-cut ruby, weighing 5.03 carats, is set within a brilliant-cut diamond surround, extending to the ring’s shoulders. It is estimated at HK$220,000-280,000 (US$28,000-36,000) and accompanied by an AGL report stating that the natural ruby has no indications of thermal treatment and originates from Mozambique. Discovered during the late 1970s, the Snezhnoe ruby and sapphire deposit in Tajikistan was active until the collapse of the former Soviet Union in the early 1990s and the outbreak of regional conflicts. Rubies from the Pamir mountains are known for their highly saturated, slightly pinkish red rubies. This Ruby and Diamond Ring features a ruby cabochon, weighing 10.06 carats, within a surround of marquise and brilliant-cut diamonds, to a stylised gallery and half hoop set with brilliant-cut diamonds. 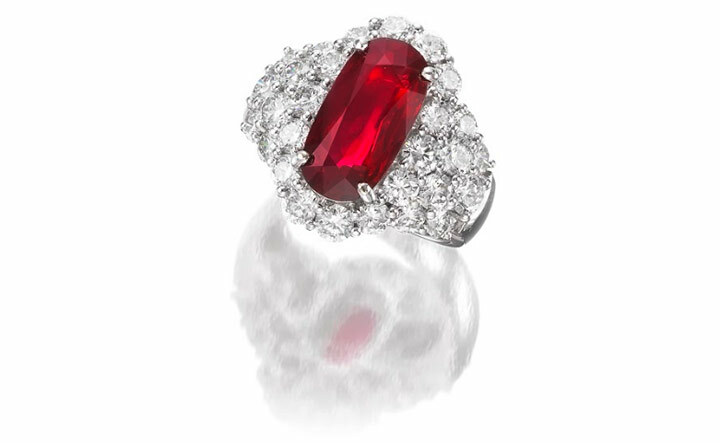 Originating from the famed Pamir region, it is estimated at HK$920,000 – 1,200,000 (US$120,000 – 150,000) and accompanied by various reports including a Gubelin report stating that the natural ruby has no indication of heat treatment and originates from Tajikistan (Pamir) along with a Gubelin information sheet on the rarity of unheated rubies. Sapphires are among the most highly prized gems for serious collectors and investors. Kashmir sapphires are extremely rare; after the discovery of the mine in the high Himalayan mountain region of northwest India in 1881 the majority of mining activity took place during the following decade, after which the supply was essentially exhausted. Sapphires hailing from Kashmir display a velvety quality and a rich blue tone unique to the region. A fine example of these properties is this Kashmir Sapphire and Diamond ring, estimated at HK$1,300,000 – 1,800,000 (US$170,000 – 230,000), the Kashmir sapphire weighing 4.21 carats is accompanied by a certificate from SSEF laboratory. Sri Lanka was affectionately known as Ratna-Dweepa which means Gem Island. The name is a reflection of its natural wealth. Sri Lanka, formerly Ceylon, remains one of the single most important sources for fine gemstones and the country is renowned for producing top quality sapphires. 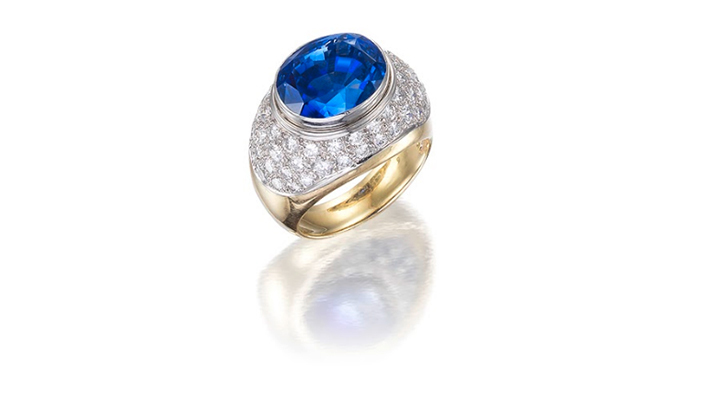 In its forthcoming sale, Bonhams will be offering A Sapphire and Diamond Ring, By Tiffany & Co. for sale. The oval-cut sapphire, weighing 12.46 carats, is estimated at HK$250,000-350,000 (US$32,000 – 45,000). It is accompanied by an AGL report stating that the natural sapphire has no indications of heat treatment and originates from Ceylon (Sri Lanka). Colombia is the country that mines and produces the most emeralds. It is estimated that Colombia accounts for 70-90% of the world’s emerald market. The country is also the source of the finest quality of old mine emeralds that are the rarest and the most sought after. 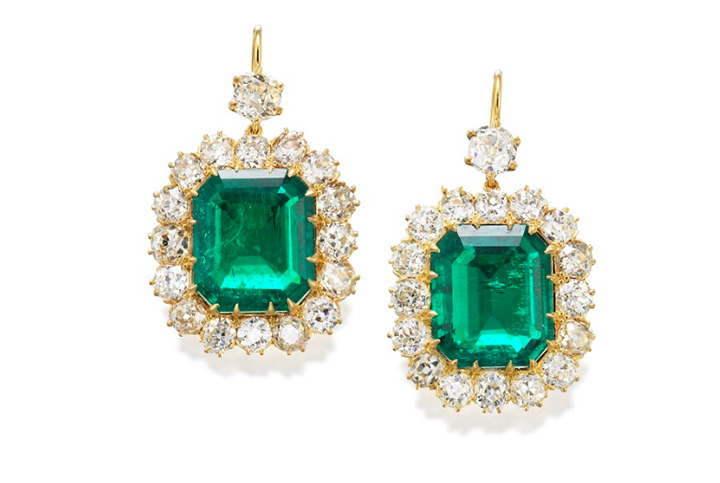 Bonhams is delighted to offer An Important Pair of Emerald and Diamond Earrings for sale. The step-cut emeralds, weighing 10.91 and 10.26 carats, are particularly impressive given a single 10 carat emerald of this quality rarely appears at auction and a pair of 10 carats come up even less frequently. Estimated at HK$3,800,000-4,800,000 (US$300,000 – 360,000) each emerald is set within an old brilliant-cut diamond surround, suspended from a similarly cut diamond surmount. The earrings are accompanied by an AGL report stating that the natural emeralds have insignificant indications of clarity enhancement and originate from Colombia. Another lot which is set to secure interest from buyers globally is A Fine Emerald and Diamond Necklace. Featuring two striking step-cut emeralds, weighing 7.42 and 4.51 carats, the emeralds are suspended from pear and marquise-cut diamonds, accented by a similarly cut diamond. Estimated at HK$1,600,000-2,000,000 (US$210,000- 260,000), the necklace is accompanied by a SSEF report stating that the two natural emeralds have minor indications of clarity modification and originate from Colombia. 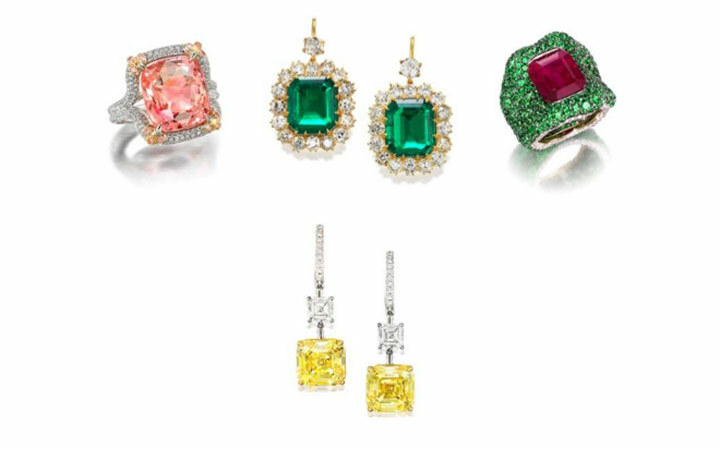 Brazil is known for producing a wide variety of fine coloured gemstones such as Santa Maria Aquamarines and Imperial Topaz. Emeralds were first thought to be discovered in Brazil around 1920 but supply only became consistent from the 1970s. Its mines are now supplying the best emeralds Brazil has ever produced and the finest quality stones from them are being compared to their Colombian counterparts. 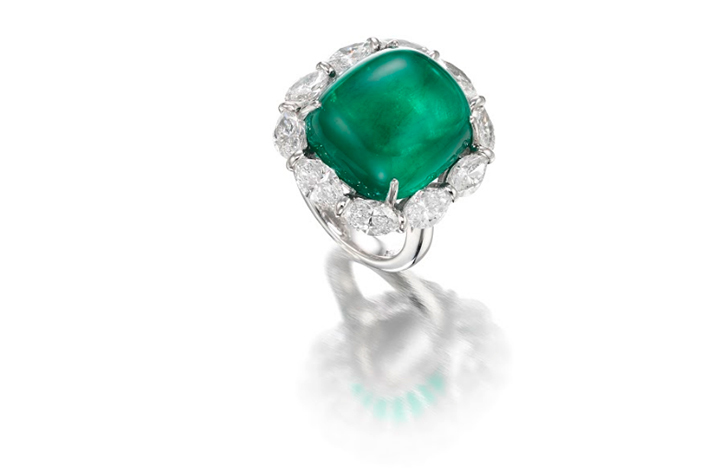 Originating from Brazil, this Emerald and Diamond Ring is a real showstopper. The cabochon emerald, weighing 24.49 carats, set within a marquise-cut diamond surround, is estimated at HK$1,200,000-1,600,000 (US$150,000-210,000). It is accompanied by a SSEF report stating that the natural emerald has no indications of clarity modification. Jade is a spiritual stone with significant meaning that’s intricately woven into the Chinese culture. The price for fine quality jadeite has risen and the demand has significantly outpaced the supply of this rare material. The Chinese have revered jadeite’s fine green colour since its discovery in Burma centuries ago. Top quality jadeite is rare. Vivid, sleek, and translucent, magnificent jadeite commands some of the highest prices among gems in today’s international market. 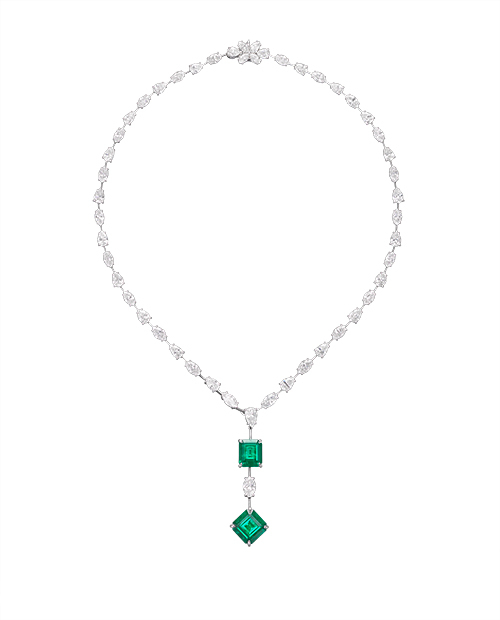 Bonhams will offer A Jadeite and Diamond Necklace, Ring and Earring Suite for auction in its 31 May sale. 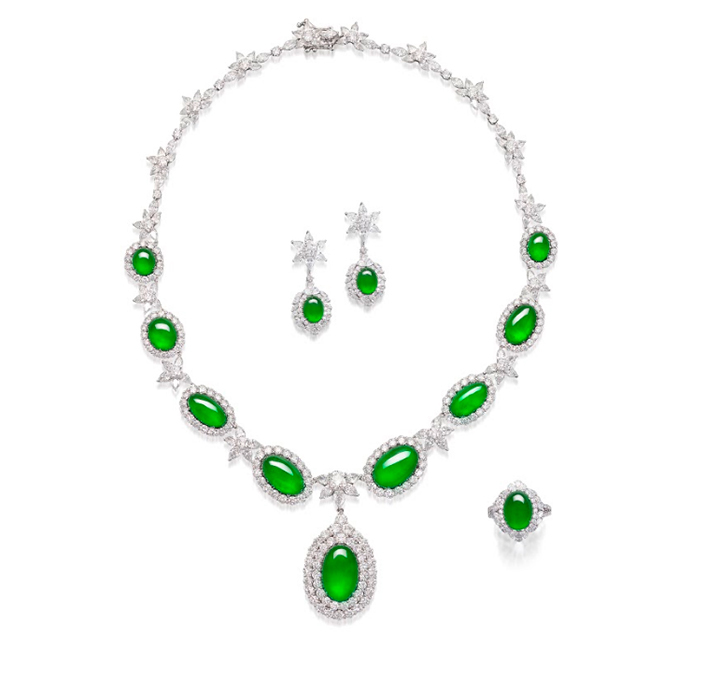 The necklace composed of nine jadeite cabochons of intense emerald green colour is accented by pear and brilliant-cut diamonds, the ring and pair of earrings en suite. The pendants on the necklace and earrings are detachable, making this a wonderful piece of transformable jewellery. The suite has a pre-sale estimate of HK$1,500,000-2,000,000 (US$190,000-260,000) and is accompanied by three Hong Kong Jade & Stone Laboratory reports stating that the natural colour fei cui (jadeite jade) have no resin detected. As well as significant gemstones featured in The Jewels of the World collection, Bonhams has selected an exclusive number of pieces of jewellery created by famed jewellers from specific countries. One such piece is by French jewellery firm Mauboussin. Renowned for its outstanding craftsmanship the best cut stones and most finely crafted jewellery sculptures, Mauboussin creates French pieces for women in France and around the world. This Emerald, Ruby and Diamond Necklace, Brooch and Earring Suite, in the famous tutti-frutti style, was created by the jeweller, circa 1965. 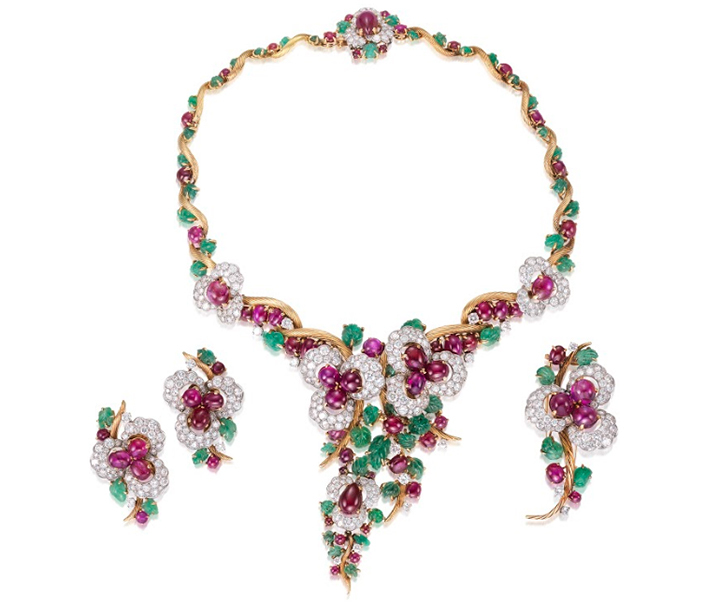 It includes a necklace of floral design supporting an articulated garland, set throughout with carved emeralds, cabochon Burmese rubies and brilliant-cut diamonds; the brooch and pair of earrings en suite. In total, it features approximately 27.20 carats of diamonds, approximately 36 carats of emeralds and approximately 105 carats of Burmese rubies. It has a pre-sale estimate of HK$950,000-1,200,000 (US$120,000-150,000) and is accompanied by three AGL reports, stating that the natural rubies have no indication of thermal treatment and originate from Burma (Myanmar). Padparadscha sapphires may be little known to newer collectors but they are treasured by gemstone connoisseurs. The term Padparadscha is derived from the Singhalese word for a salmon coloured lotus blossom. 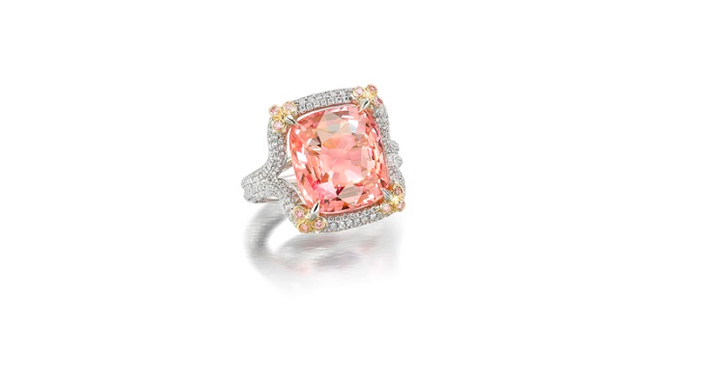 No other coloured gemstone compares to their unique mix of pink and orange. To be named a Padparadscha, the gem should exhibit both colours in an even balance of saturation. This Padparadscha Sapphire and Diamond Ring is strikingly beautiful. The cushion-shaped Padparadscha sapphire, weighing 10.27 carats, is set to a bifurcated hoop and gallery set with brilliant-cut diamonds, accented by similarly cut diamonds of pink tint. It is estimated at HK$620,000-670,000 (US$80,000 – 86,000). Accompanied by an AGL report the natural Padparadscha sapphire has no indications of heat treatment and originates from Madagascar. Australia is considered as an important gemstone market. The country generates some exceptional gemstones, specifically opal, diamond, chrysoprase and sapphire. Black opal is by far the most valuable and appreciated of all opal varieties, especially those from Australia’s famous Lightning Ridge. 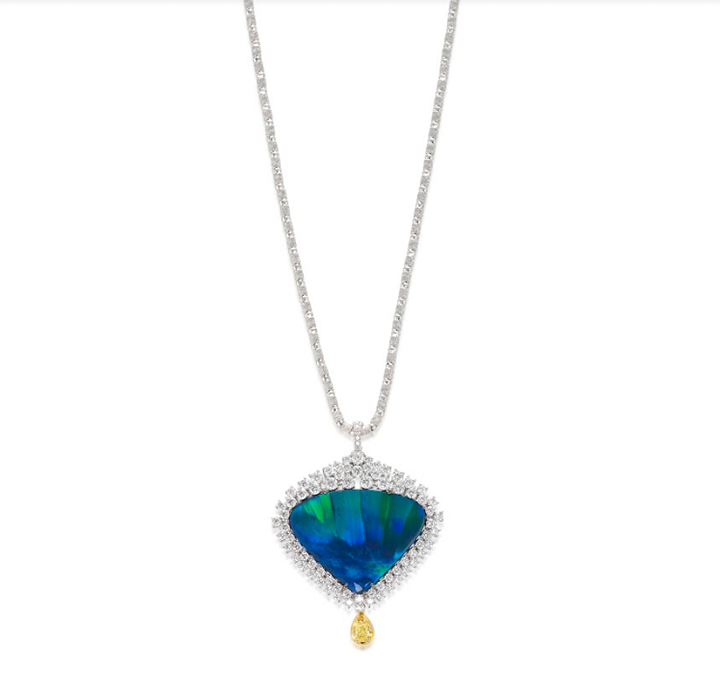 This Australian Black Opal and Diamond Pendant Necklace displays vivid and intense flashes of blue and green in a peacock play of colour pattern typical of fine black opals. Thought to be from Lightning Ridge, the cabochon black opal, weighing 33 carats, is surrounded by brilliant-cut diamonds and features a suspended pear-shaped diamond of yellow tint. It is estimated at HK$330,000-420,000 (US$43,000-54,000). 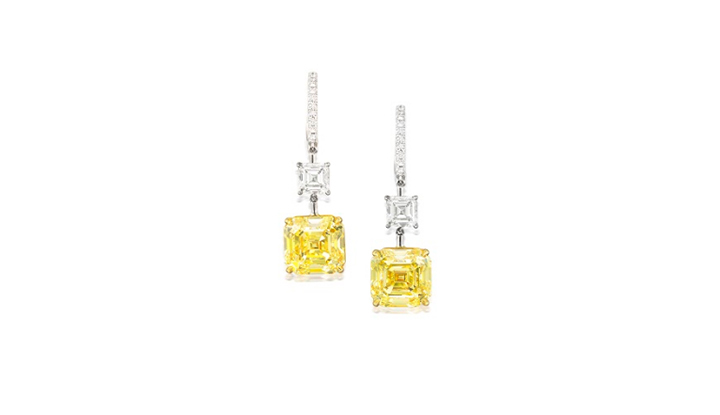 A Pair of Namibian Fancy Coloured Diamond and Diamond Earrings by Forevermark: Each asscher-cut Fancy Intense yellow diamond, weighing 5.26 and 5.17 carats, VVS1 clarity, is suspended from a similarly cut diamond surmount. The striking earrings are estimated at HK$2,300,000-2,800,000 (US$300,000-360,000) and are accompanied by two GIA reports. A Fancy Coloured Diamond and Diamond Ring: Fancy Green diamonds are one of the rarest colours of all diamonds and are mined in South America and Africa. Natural green diamonds are so hard to come by that few will actually ever see, let alone hold, one in person. Bonhams is proud to bring this stone to auction and is anticipating strong interest from collectors given its rarity. 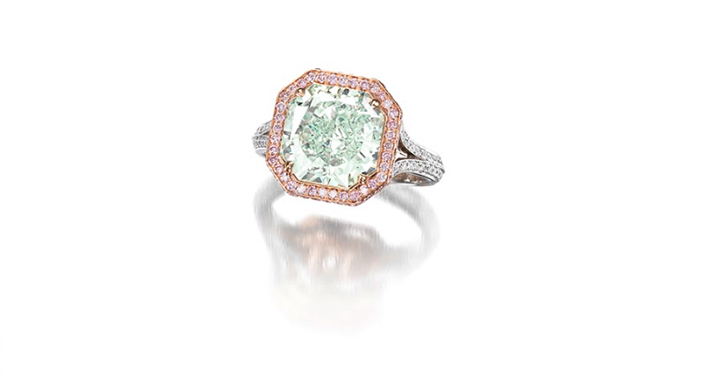 The radiant-cut Fancy Green diamond, weighing 5.03 carats, surrounded by brilliant-cut diamonds of pink tint, with similarly cut diamonds extending to the bifurcated shoulders. It is estimated at HK$3,100,000 – 3,800,000 (US$400,000 – 490,000) and accompanied by a GIA report stating that the 5.03 carat diamond is natural Fancy Green colour. Bonhams sells more jewellery lots each year than any other international house and has more dedicated jewellery auctions annually.